This provocative graphic novel made me deeply uncomfortable and yet I’m glad it did. I’m relieved to say that nothing like the traumatising physical encounter between the author, Olivier Ka, aged 12, and the adult priest, Peter, ever happened to me in my childhood. But reading Ka’s fearless account brought back almost forgotten memories of a particular teacher who I liked and who befriended me at school when I was maybe 9 or 10, of lunch hours spent alone with him in his study, of his offering me my first pomegranate, of my total innocence about his special attentions to me, of my naiveté when classmates accused me of being "teacher’s pet." It was only years later that I heard he had subsequently been caught in compromising circumstances and dismissed. How different it might have turned out for me, and how did that pupil cope? And whatever became of that teacher? So it was with something of a chill of recognition and a great deal of sympathy that I read Why I Killed Peter, the latest in NBM’s stellar line of French and Belgian bandes dessinées to be translated into English. I’ve been waiting for someone to pick it up since I discovered it in French in Delcourt’s Mirages collection in 2006. Alfred is the illustrator and Olivier Ka is the author. It puzzles me that for some reason, in the credits for most Franco-Belgian albums, the name of artist tends to precede the name of the writer. It’s almost as if what is thought to appeal to the public is the artwork so this name takes priority over the scriptwriter’s; it’s usually the opposite way round elsewhere (think Lee & Kirby or Moore & O’Neill). 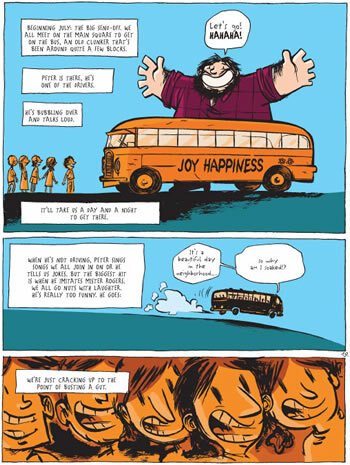 "...a painful autobiographical comic which returns to a number of anecdotes from my life, from the age of 7 to 35, all with a link to the story’s central event: the manipulation, which I was a victim of when I was 12, by a family friend, a priest and summer-camp director. 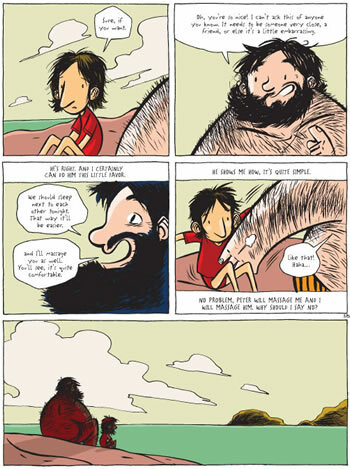 Drawn by my mate Alfred, this story seems to touch lots of people. Beyond the subject itself, what comes of out of it is a strong alliance, a solid friendship, between me and Alfred which allowed us to experience together the ending of this book through a dramatic turn of events which gives meaning to the whole thing." 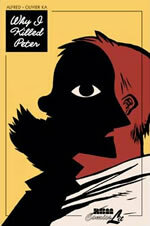 The double-profile cover image skilfully symbolises how Ka and Peter become so closely connected, both sharing the same single eye, seeing the same experience, keeping the same secret, Ka’s silhouette looking unhappy and anxious, his mouth turned down, while big, bearded Pierre seems contented. The title seems to announce that a murder is to be expected and that this is some explanation or confession. The titles of each chapter underscore this growing anticipation: "I Killed Pierre because I was 7", then "8", "9", and onward, jumping ahead to the finale aged 35. Each opens with a full-page, head-to-toe portrait of Ka looking out at us from a blank background. 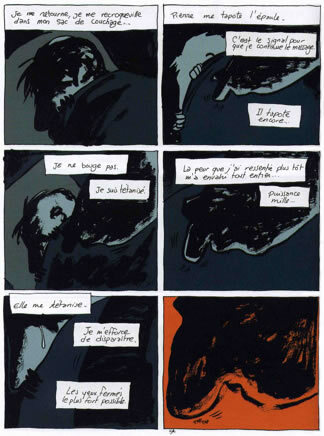 Ka set out by writing the substantial first-person text here, brimming with details and feelings, and it’s these words which Alfred has adapted into comics accompanying them with lively, inky brushstrokes, filled with flat muted colours by Henri Meunier. Alfred’s style relates to masters like Dupuy & Berberian and Blutch and will remind many of Craig Thompson as well. Religion and sexuality constantly resurface in Ka’s recollections as he recaptures the confusions of growing up and keeping a secret which agonises him into adulthood. Aged 7 and on holiday with his kindly Catholic grandparents, Ka grows tired of going with them early every morning to Mass but wonders if pretending to be sick and avoiding church is a sin. Shortly after, tucking him into bed, his grandma vividly describes hell and tells him why people go there because of doing bad things, like touching your "zizi" or willy. This gives him a nightmare, waking in tears, because he has done just that already. The next chapter conveys his parents’ loose hippie lifestyle and their summer family vacation with another free-loving couple, ending in the happiness, the ecstasy of all swimming together naked in a mountain lake. It’s on another holiday at age 9 that Ka and his family first meet the large, cheery, guitar-playing, unconventional Peter. Ka recalls him as "a populist priest. He was cool. He was funny. He was not priest, just a regular guy. It’s like I had another uncle. A great one, who laughed, who sang, who tickled." And when he is 10, Ka goes away for the first time to the summer camp Peter has set up himself and enjoys the countryside, the activities and above all the simple friendship of Peter, of being important to him. In the next chapter at twelve years, Ka and Alfred handle the episode with great sensitivity, taking 38 pages. They devote ten pages to Peter and Ka’s conversation on the beach, the scruffy boy dwarfed by the stout, very hairy priest in only his swimming trunks. They convey Ka’s feeling of privilege, of "sweet satisfaction", as Peter confides in him about his problems sleeping. But this gradually changes to unease, to conflicted feelings, as Peter suggests that to get a good night’s sleep he needs someone to massage his stomach at night, as his giant hand rubs his own tummy. Three silent, tense panels follow this, the clouds appearing in the background echoing their quiet thoughts. 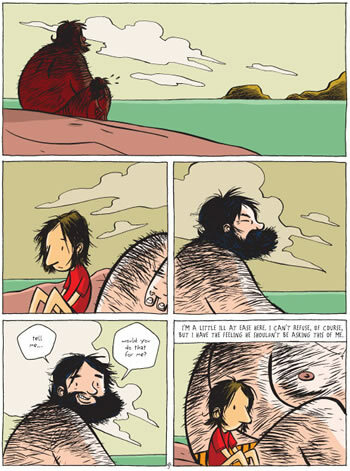 The first panel reprises a previous full-width panorama of the two of them looking out to sea, a view shown again on the next page, except that in this instance both figures sit in dark brown shadow and from this angle little Ka merges symbolically within Peter’s bulky form, three little sweat drops indicating Ka’s creeping disquiet at being unable to get out of this request. As this crucial game of "manipulation" ensares Ka, Alfred ends up transforming the two of them in two panels into a cat and mouse, a big furry cat, red and almost demonic, with Ka as a resigned, reluctant, blue-tinted mouse. The night of their eventual encounter, both naked in their sleeping bags, begins with thick, turbulent brushstrokes, like thunderclouds, filling a whole-page panel, as we hear Ka’s wish of being "far from Peter, at home, safe, in my room, in my bed". Once it begins, the panels become uniform, six per page, creating a feeling of confinement and repetition, coloured mainly in shades of green, like the inside of a tent, shifting to mauve. Over the first ten panels, all we see at first is Ka’s head, facing left, facing away from Peter, until the last panel where his huge hand taps him on the shoulder, "the signal". The next page shows six more dark, almost indistinct overhead views, with Ka now facing right, facing Peter, his hands outstretched to reach him. Then it’s Ka’s turn, and at first it doesn’t seem so bad. And they go back and forth, the images becoming increasingly blurry, abstracted, Peter’s tapping of the boy’s shoulder insisting on more, until Ka’s shocked realisation in a flash of orange of what he is touching. 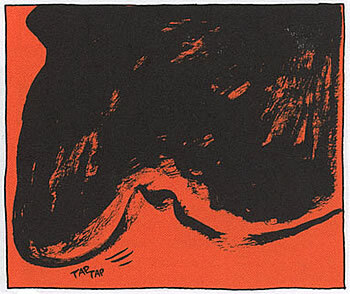 In three key panels, red, like Peter’s cat persona, returns, first as we see his profile in deep shadow, then his big forefinger tapping again and again, and finally, Ka’s last expression of distress and confusion, "He’s my friend", which is swallowed up in a storm of heavy brushstrokes. Waking early before the other kids, it’s a beautiful morning and the pair walk the dog and talk briefly about what happened the night before. Pierre asks Ka never to speak of "our secret" and Ka promises. That secret he’s sworn to keep, however, goes on to gnaw at Ka’s self-esteem. Though nothing else goes on between Ka and Peter, the priest’s presence haunts his adolescence. One summer, at the age of 15, when Ka is discovered by Peter naked in the grass with his first girlfriend, an angry-looking Peter, his hands behind his back, his face darkened and stern, orders her back to her tent. Then in one cryptic small panel his expression seems to lighten - is he happy that Ka is enjoying his first teenage passions or is he pleased that he can interrupt their love-making? He becomes an all-seeing, all-knowing judgmental presence in Ka’s mind, spoiling his romance, making him fearful. It’s the last time he goes away to the summer camp. At 16, quitting school, his parents splitting up, Ka tells his mother, who seems to admire how maturely he handled it. But breaking his promise seems to unleash self-recriminations at how naive, impressionable and blind he was, and he decides to tell no one else, bottling it all up. Alfred closes this chapter with the young Ka looking over his shoulder at a huge, menacing shadow of the bearded priest. Ka’s memoir jumps now from age 19, and the pleasures of sharing a Paris flat with his true love and having their child, forward to age 34, when an invitation to a church wedding with a vicar and choir stirs up all his anger at Peter and at the hypocrisy and lies of the "Cathos" and brings on a crisis. In a riveting scene drawn with Expressionist distortion, Ka flees the church and runs down to the beach, collapsing and screaming. What follows is a brilliantly staged spread of fever-dream or delirium, scrawled as if in a heat haze, as Ka argues with Peter, as he sings to his guitar, his old-fashioned grandmother, his simpler child self, his older adolescent self. In a brilliant device, the panels and balloons start revolving and forcing the reader the turn the book on its side to follow the second page, creating a literal turmoil. 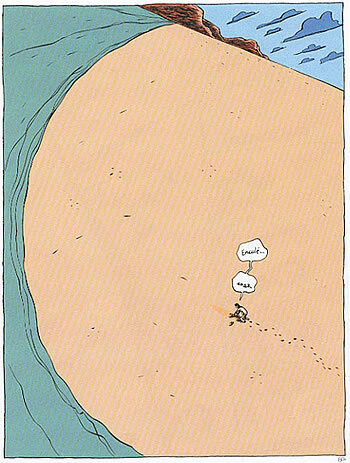 The final full-page panel shows Ka, tiny, cursing, collapsed on the seashore, seen from above in a distorted perspective. Is it just me or does the beach look like a large stomach, the blue sea like a blue, rolled-up T-shirt, taking us back to that night which Ka has never escaped from? 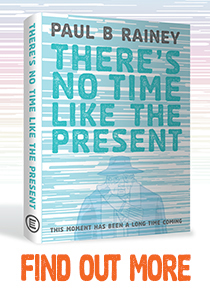 We now come to the 32-page final chapter, a tour de force. This deserves in particular a spoiler alert, so be warned! Ka is now 35 and has a daughter of 12, the same age he was when that night took place. He is troubled, sleeping badly, ashamed, unsure, haunted by his conflicted feelings about Peter. To find some way out of this, he resolves to write the whole story down, in all its details, taking weeks. Writing ‘The End’, he is unsure whether getting the story down on paper has really "killed Peter", as in wiping away those memories, but he feels some sense of peace with himself. Out of this writing comes the idea of adapting it into a graphic novel with Alfred and while in the process of this, Alfred drives him back to the summer camp, to get some reference photos and get a sense of the atmosphere of the place. Ka has heard that Peter may be dead, the summer camp closed. 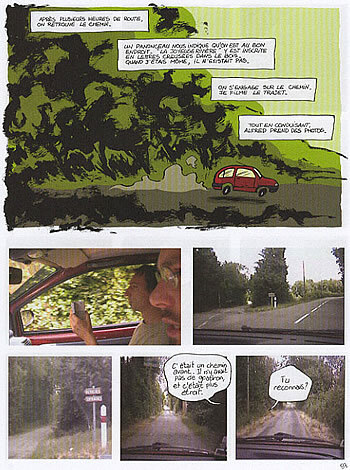 At this point Alfred’s drawings give way to the digital photos he’s snapped as he drives through the countryside. And as they arrive, the 35th photo startles them and us - there is someone on the premises. Ka exclaims, "It’s Peter!" He’s alive and in front of him after all these years. Alfred resumes drawing here but he never shows us Peter, only in silhouette or a part of his body, now much smaller, without a beard, unable to open a bottle of orange juice. Being confronted all these years later creates an extraordinary denouement, totally unexpected and profoundly moving. The graphic style shifts once more when Ka finally walks with Peter and tells him all that he feels. Over these 13 pages, we see only digitally adapted photos, two per page, of the buildings and landscape of the camp, abstracted to black and white and then coloured in, disorientating, as if from a subjective viewpoint, seeing but not seeing, the narration changing to mainly descriptive captions. Ka has the first sixty pages of the album with him, the pages we’ve just read. 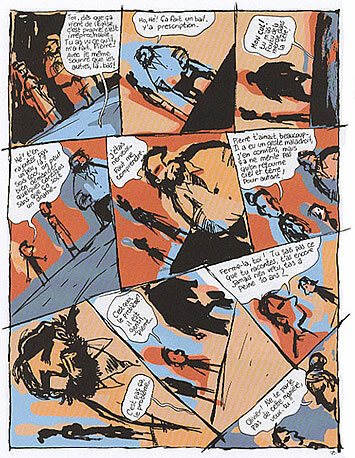 Alfred uses a whole page, roughly drawn, to convey Peter gripping this portfolio as he reads the comic. It’s a moment of such heightened tension and emotion, that four of these half-page photographic panels are left textless, leaving space for the reader’s own emotions to breathe. 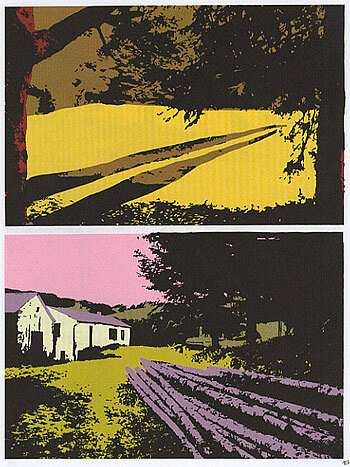 The book ends with Alfred’s linework evaporating into a sunset glow, reduced to the barest outlines of road and trees. Then over the page all eleven of Ka’s former selves from the chapter openers come together in one final group self-portrait. The difference though is that every one of them is now smiling. Ka and Alfred take us through a journey of exceptional candour and catharsis, one that I believe will touch many, many readers as it did me. This is one of the most powerful autobiographical memoirs so far in 21st century French comics and one of the essential graphic novels of the year. 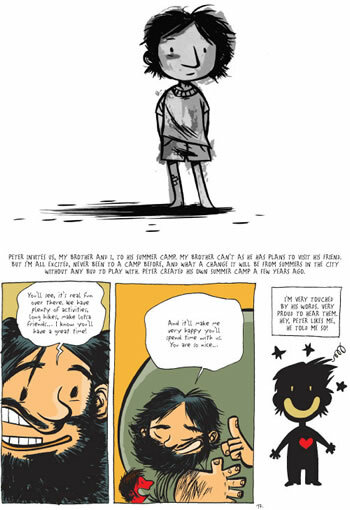 More pages from Why I Killed Peter are available to preview here.